The RB250GS is a small SOHO switch in a plastic case. 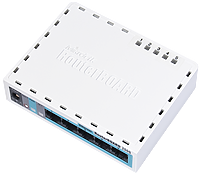 It has five Gigabit ethernet ports powered by an Atheros Switch Chip. It is powered by a new operating system designed specifi cally for MikroTik Switch products - SwOS. SwOS is configurable from your web browser. It gives you all the basic functionality for a managed switch, plus more: Allows to manage port-to-portforwarding, apply MAC filter, configure VLANs, mirror traffic, apply bandwidth limitation and even adjust some MAC and IP header fields.